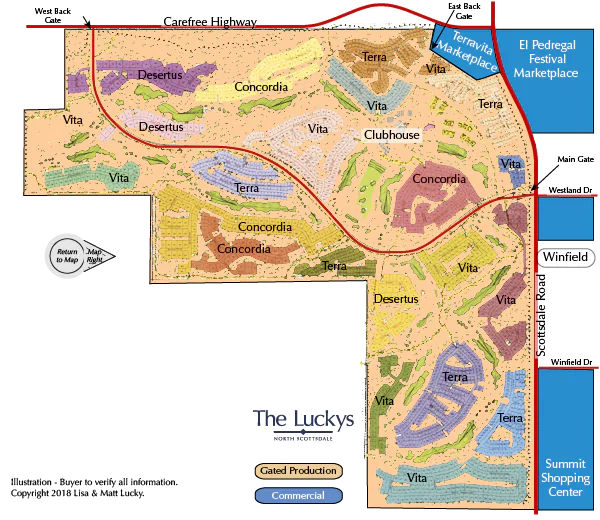 Terravita is a guard-gated mater-planned Del Webb community of 823 acres in North Scottsdale. The community includes a wide range of homes with great floor plans suitable for everyone from larger families to couples looking for a part time or retirement residence. Amenities at Terravita include a 18 hole championship golf course, clubhouse facilities with dining, a swim and tennis center, a health and fitness center and a community wide 6 mile long system of jogging and walking trails. There are 1,380 homes in Terravita consist of 4 series (collections) of floorplans. There were 20 different floor plans, with some having an option to add a casita, ranging from 1,500 to 3,800 square feet. The Terravita Map above identifies the Terravita Series for each area. Former model homes are found adjacent to the clubhouse. Terravita golf and the Terravita Golf & Country Club are of great interest to many buyers. The golf course at Terravita was created by PGA Hall of Fame member Billy Casper and designer Greg Nash, whose name is synonymous with beautiful, playable golf courses that provide fun, fair challenges to players of all abilities while blending seamlessly with their natural surroundings. The Terravita golf course is an excellent example of Greg’s design skills. Terravita Country Club amenities include a pro shop, a large driving range, and three separate areas to practice chipping and putting. 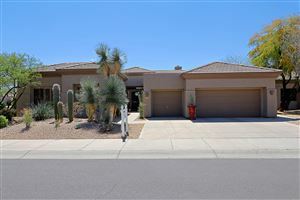 North Scottsdale residents may join Terravita Counrty Club without having to live in Terravita.